In the last 12 months I have been using black linen for various embroidery projects from handkerchiefs with machine embroidered lace borders to small hand embroidered images. An earlier post was titled spots. I used spots to link a few pieces that were grouped together in an exhibition. While travelling to Sweden some years ago I picked up a book at the Nordiska Museet. It was titled 'Yllebroderier Berättande folkkonst från Norden' (2010). I have no translation but there are beautiful photographs of this folk embroidery from around the 1700 through to contemporary examples of the present day. What interests me with this work is that much of it is done on cloth of a dark background. This sets the red thread off in a very striking manner. 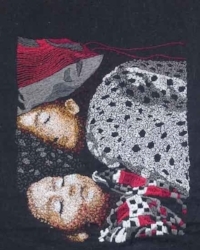 The book seems to explore the origins of this style of embroidery. Each chapter is written by specialists and academics. I can only go by the images and there seems to be a relationship to southern European religious art, although there is not a lot of religious imagery in the the Swedish embroidery. I may be wrong. The red dala horse appears quite regularly. The works below are on black linen. In the last week I have begun to add red thread in the self portrait. This is a work in progress. I feel it has moved from a self portrait to more about embroidery, which I suppose is a essential part of me and hence adds to the concept of self portrait.